Ever fantasize about walking into work, telling off your boss, and quitting on the spot? There’s a niche movement in the personal finance world known as “FIRE”: financial independence, retire early. The premise is simple: build enough passive income to cover your expenses, so you no longer need a job to pay your bills. Imagine what you could do with your life, if you didn’t have to work to live! But while the concept is simple enough, the execution is a little trickier. What does it take to reach financial independence within five years? To retire young and only work if you choose to? The good news is that it’s easier than ever before to do. The bad news? It still takes plenty of good ol’ fashioned work and discipline. Not scared off yet? Here’s a model for retiring young through rental properties, but first, let’s look at the “classic” model of retirement, so you have a baseline for comparison. 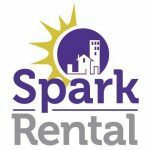 This post was written by our partners at SparkRental, whom provides rent automation services (including rent deduction from the tenant’s paycheck), along with a series of free landlord resources. Before the mid-20th Century, people didn’t really retire by choice or design. They worked until they either died or physically could not work anymore, and hopefully, their pension and/or their children took care of them after that. Which usually wasn’t very long, because the average person just didn’t live very long. Life expectancy for a baby born in 1936 was a measly 58.5 years! As Americans started living longer, many employers struggled to pay for increasingly long retirements among their former employees. Many employers switched from a defined benefit plan (e.g. a pension) to a defined contribution plan (e.g. a 401K), in which the employer helps the employee plan for their own retirement. Except most employees had (and still have) no idea how to plan their own retirement. 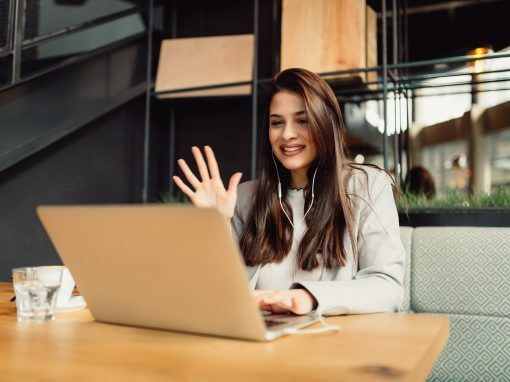 Suddenly demand for financial planners bloomed, and while they will tell you that everyone’s needs are different, ultimately their advice goes like this: save and invest a huge nest egg over your 40-year career and then gradually draw it down in retirement. How gradually can you draw down your nest egg? How much of a nest egg do you need? 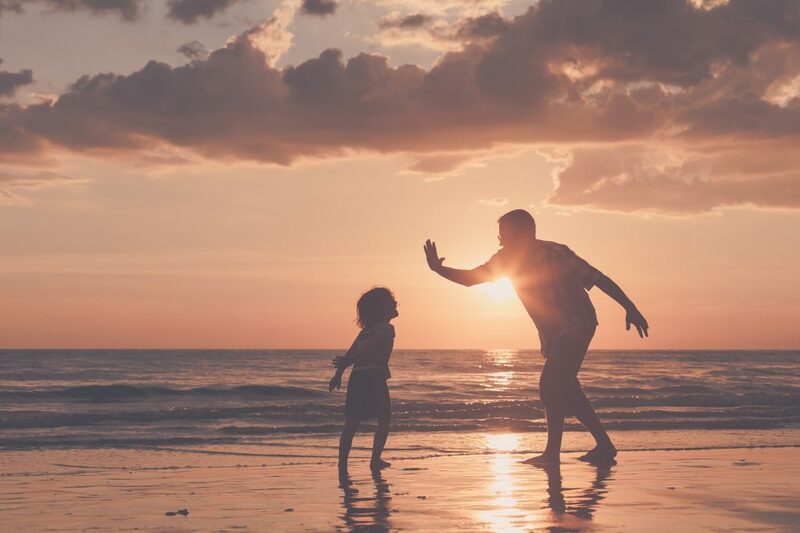 According to a classic economic study back in the ‘90s by financial advisor William Bengen, retirees can withdraw about 4 percent of their nest egg every year and expect it to last at least 33 years. 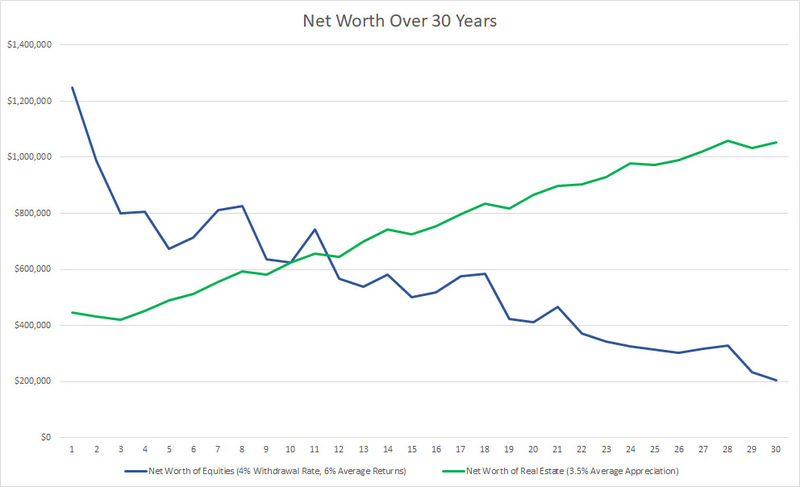 He reviewed 50 years’ worth of economic data from the mid-20th Century and found that retirees would almost certainly not run out of money in less than 33 years, at a 4 percent withdrawal rate. Thus, he argued, drawing down 4 percent annually is a safe withdrawal rate. Economists and personal finance experts disagree over whether the 4 Percent Rule is still so safe today, but for our purposes, an exact safe withdrawal rate is beside the point. The point is that the entire notion of safe withdrawal rates revolves around gradually selling off your assets. Around a dwindling nest egg, that one day runs out. Which is a problem, if you want to retire young and live for another 40, 50, 60 years. The solution? Assets that produce ongoing, regular income, without needing to be sold. Assets like rental properties. According to the 4 Percent Rule, you’d need a nest egg of 25 times your annual spending, if you plan to withdraw 4 percent each year. Thus, it would take a nest egg of $1,250,000 to cover $50,000 annual spending (4 percent of $1,250,000 is $50,000). Pretty daunting numbers, eh? For the sake of argument, let’s say $50,000 is what it would take for you to be able to retire. How would it look different, to reach that figure using rental properties? Let’s say you buy five properties, each of which nets $10,000/year. You earn $50,000/year in income, and it feels a lot less intimidating than saving up $1,250,000. 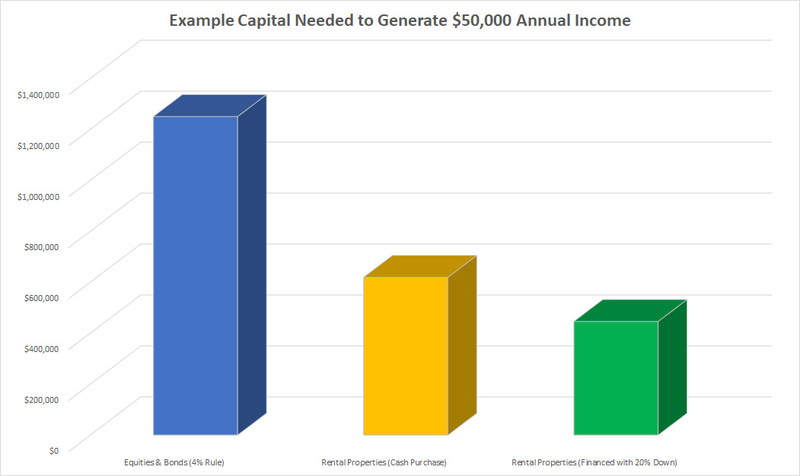 But let’s dig a little deeper into what it takes to buy five rental properties that each nets $10,000/year. We’ll need to make a few assumptions. Let’s assume half of your rental income goes toward expenses, such as repairs, vacancies, property management fees, taxes, insurance, etc. That means you need a property that rents for about $1,650/month, for net monthly income of $825, which is roughly $10,000/year net income. Let’s say you buy for 75 times rents or properties that rent for 1.5 percent of the purchase price. That means you’d be investing around $123,750 for a property that rents for $1,650/month. So far so good? You buy a rental property for $123,750, which nets you $10,000/year. To reach your $50,000 goal, you buy five of these, for a total of $618,750. Which is less than half of the $1,250,000 nest egg you would have needed under the 4 Percent Rule. But if $618,750 still seems like a lot of money, fret not. You have another advantage: you can borrow someone else’s money to buy these properties. Most rental property loans require a 20 percent down payment. Thus, let’s say you borrow 80 percent of the first $123,750 property (a mortgage of $99,000), and put down $24,750. At a 6 percent interest rate, your monthly payment would be $593.56. That means your net monthly cash flow drops from $825 to roughly $231. That’s about $2,772/year in net rental income. You can play around with those numbers using a rental income calculator. If you finance your properties and earn less cash flow from each one, you’ll need more properties to reach your $50,000 target. At these numbers, you’d theoretically need 18 properties instead of five. But even if you bought 18 of these properties, if you only put down $24,750 of your own cash for each, that’s a total of $445,500 cash investment. That’s compared to $1,250,000 according to the 4 Percent Rule, and $618,750 for buying the properties in cash. Let’s not sugarcoat it – $445,500 is still a lot of money. But the power of compounding helps you get there much faster. Say you buy your first property for $123,750 and finance it, coming up with a 20 percent down payment ($24,750). Your net income the first year is $2,772, which you put toward buying your next property. That means you need to save up $21,978 for the second property. At the end of Year 2, you’ve doubled your annual cash flow, to $5,544. You put that toward a third property nine months later, and suddenly you’re earning $8,316/year from your rentals. Every time you roll that revenue into a new rental property, your income snowballs. Which means you can buy properties faster and faster, as more income stacks up. After five years, say you have a portfolio of eight properties. Of those, most have gone up in value, to varying degrees. One, in particular, appreciated quickly and is now worth $180,000. You decide to sell it and use the money to pay off two of your other mortgages. That leaves you with seven properties, two of which are owned free and clear. That’s $20,000 annual income from the free and clear properties, plus $13,860 from the five properties that still have mortgages. An annual net income of $33,860. From there, you can buy more properties, or take all the rental income and put it towards paying off one of your existing mortgages. See how quickly you can stack up passive income, leveraging rental property loans to buy properties faster? Yes, these numbers are all theoretical. But they illustrate an important point: financial independence and early retirement are not as distant as they might seem right now. Certainly far less distant than saving up a million dollars! Nor do you need to necessarily put down $25,000 for each property. 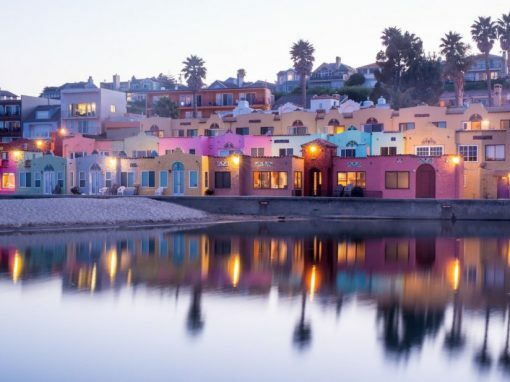 You could buy less expensive properties, or you could house hack and put down only 3 to 5 percent instead of 20 percent of the purchase price. Rental properties come with other advantages over bonds or equities as well. First, the returns are more predictable. You can forecast a rental property’s cash flow quite accurately since both rents and expenses are easy to forecast. Rents are far more stable than stock values, too. And it’s rare for rents to drop, unlike stock prices! Another advantage? 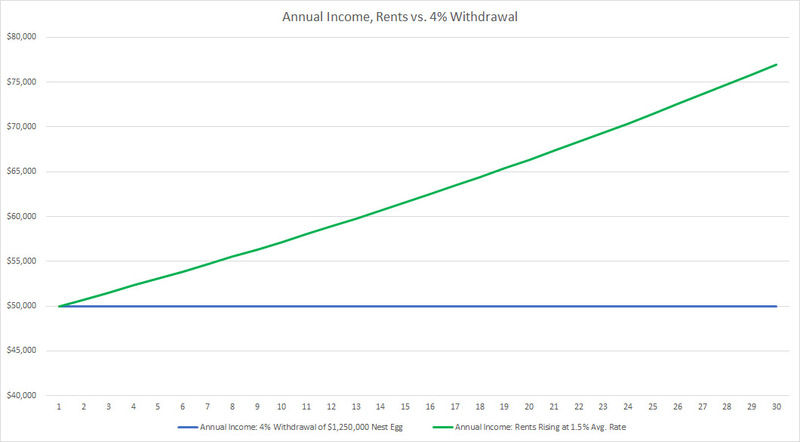 Rental income inherently adjusts for inflation. Landlords typically raise the rent 1-4 percent each year, even while their mortgage payment remains the same. That means that over time, the landlord’s net income rises far faster than inflation. Then there are the tax advantages. Every “real” expense – from repairs to taxes to property management fees – is tax deductible. Which says nothing of paper expenses like depreciation, that allows property owners to deduct expenses they didn’t actually have to pay. Save up some money for a down payment toward your first property. With each property you buy, your income will grow, allowing you to exponentially grow your portfolio faster. Early retirement is not a myth. The path to reach it starts with a single step, a single property generating extra income. Author Brian Davis is real estate investor, educator and service provider. He co-founded SparkRental, which provides rent automation services (including rent deduction from the tenant’s paycheck), along with a series of free landlord resources. If you’re new to real estate investing, he and his partner Denise Supplee offer a free mini-course on passive income from rentals at SnapLandlord.com.